On Saturday we were upstate for the weekend with my diehard Soxfan parents, who made the trip out to Columbia County to visit the SF clan. Our son Isaac of course made his weekendly demand for a visit to our wonderful local used bookshop, Rodgers Book Barn. 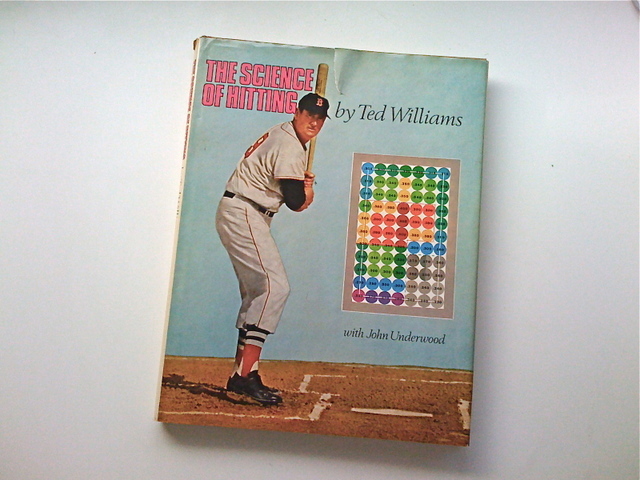 It must have been something about the high percentage of Royal Rooters in the house (literally, it’s a house), because as we were walking away we noticed a hardcover copy of the book that the above image is taken from, Ted Williams’ classic “The Science of Hitting“. It was four bucks, so an automatic purchase since our only copy of the book is a reprinted paperback. The bonus was that, upon further inspection, we discovered it to be a first printing, and in darn good shape at that. It’s worth well more than the four bucks we shelled out. 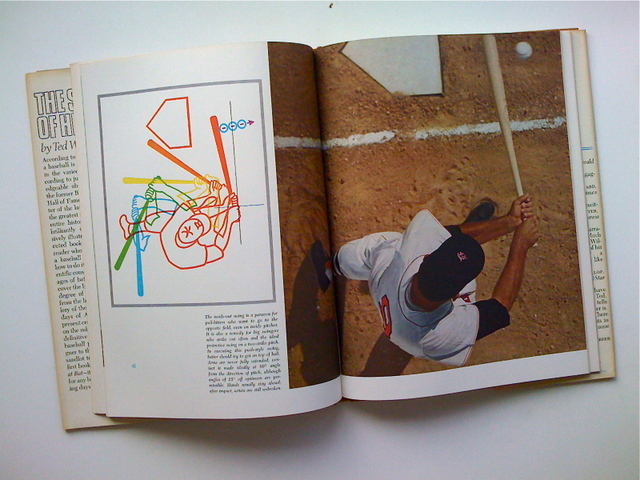 The 1971 book is a classic of baseball instruction full of helpful illustrations and handy tips for the devoted ballplayer, even if impossible to emulate as an amateur. Williams’ first person narration is rich and anecdotal; it reveals the great depth of Williams’ historical knowledge of the game. It is up there with Ben Hogan’s Five Lessons: The Modern Fundamentals of Golf, one of the greatest pro-to-amateur sports instruction manuals ever published. And, to this design nut, there is an amazingly modern graphic sense to some of the diagrams, particularly for a sports instruction book. The image at the top of the thread is from the cover, a hit chart representing Wiliams’ hot and cold zones, done decades in advance of the visual information we are given on a nightly basis via ESPN, NESN, YES, etc. There is also some beautiful photography, in particular a sequence showing Williams’ swing as it passes through the plate, shot dramatically from above the dish. We were lucky to find this. A couple of pictures follow after the jump. Wow. A splendid find indeed. I am so ‘book jealous’ now. Good book, as long as you can stand Ted Williams taking a few sentences every now and then to remind you of how great he was… which I suppose is fine because he was great. As for the insight, you can’t beat it. Williams was ahead of his time without a doubt. Great story; great book. On a similar note, a few years ago I found a copy of Charlie Lau’s classic batting primer, “The Art of Hitting .300” at a used bookstore. Like the WIlliams book, its cover is a fine piece of information design: a time-lapse photographic sequence of George Brett in action. Edward Tufte would be proud of both, I think. Whether either would improve his ability to hit a change-up is another question. Columbia County, and the Hudson Valley in general, is a great place to live. In other news, BASEBALL IS LESS THAN 24 HOURS AWAY!!!! I love the hot-zone graphic. First time I ever saw it was on my one and only trip to Cooperstown, where they have all the circles shown as baseballs painted the appropriate colors with the batting averages on them. Even at 8 or 9, I was amazed — and still am — at how consistently great Williams was, no matter where the ball was pitched. Must.. find.. this.. book.. haha..
Look how high the strike zone is on that cover. Oh, to have the umpires enforce the rules of the game. Hasn’t the strike zone changed since then? I remember back in the mid-late 1990s, they made it from letters to bottom of the knee (as opposed to the top), and that only lasted a couple years. 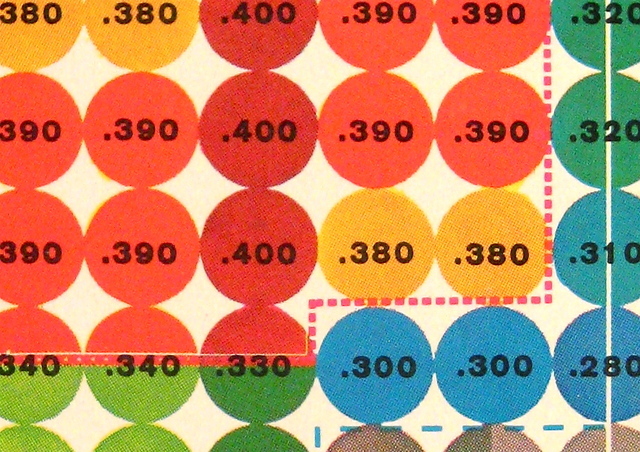 for what it’s worth, there is a great representation of that hit chart/hot & cold zone breakdown at the hall of fame that uses painted baseballs for each spot in the strike zone. Ho-ly-crap. ESPN really is doing its best to prove Hank Steinbrenner right. Look at the front page of ESPN.com. Never, ever before have I seen such adulation of a team that’s, honestly, not really that great. It’s funny how the ‘buffoon’ is turning out to be not such a buffoon after all. Sorry for crapping on this excellent post. One of the mods can move it somewhere else if they wish. Wait, so ESPN shouldn’t profile the defending champions the day before the regular season begins? What, exactly, is the “too much adulation”? The recognition that they are the only team this century to win two titles? The acknowledgement that they are the favorites to win it again? The statement that they could be baseball’s next dynasty (already the subject of an SI cover story)? This is the evidence of a Red Sox bias? You’ll have to do better than that. I’m pretty sure the Yanks had their share of ESPN front-page headlines in the late 1990s. Losing in four games to the Indians isn’t exactly the way to get back there. Please note, I’m not saying any of those things are true. I’m not sure what a dynasty truly is, I’m not very confident in the Sox’ ability to repeat (even though I predict that they will in our “official” predictions to be posted later), and I’m more than a bit uncomfortable with suddenly being the consensus favorite of the ESPN crowd. But you can’t deny that most people are picking the Red Sox to repeat, and that the “dynasty” meme has been in vogue ever since Game 4. The fact that ESPN discusses this the day before Opening Day strikes me as the correct thing to do, from a sports news standpoint, as opposed to any Bristol-based homerism. hank said “Everyone loves a winner”? i had no idea. it seems like that’s an adage that’s been around a lot longer than hank. paul- i was just gonna ask for the YFSF predictions for 2008 thread. Losing in four games to the Indians isn’t exactly the way to get back there. Paul, you’d probably be better served by not adding this kind of zing at the end of what is otherwise a defensible position re: ESPN. This is pretty much flamethrowing and not really necessary. But, everyone, can we PLEASE keep this thread about the book? We’ll have plenty of time to discuss Hank, the Sox, Yanks, ESPN, etc., somewhere else. This thread isn’t for that. Fair enough. The “not not really that great” line got my goat a little bit. Back to topic, it’s coincidentally appropriate you bought this book right as the Top 50 list begins discussing some of Williams’ best seasons, SF. Back on topic, one striking image of Cooperstown is definitely the ‘hot/cold’ zone with colored baseballs. One of the clear memories I have of the place. Does anyone know where there’s a hot/cold zone chart for every major league player? It would certainly add (or aid) an interesting dynamic to watching baseball games, when we’re not graced with the flashy, distracting ESPN or Fox Sports graphics. Not that I know of Andrew, but now that MLB this season should have its GameCast pitch data in every ballpark, it wouldn’t surprise me if we start seeing them next winter. It would indeed be a terrific resource. I agree. The hot-zone exhibit and the plaque room are my only two clear memories of Cooperstown.